In the jazz lounge, three performances, on 23, 24 and 25 August, by guitarist Mike Stern. Joining Mike are Jim Beard on keyboards, Hadrien Feraud on bass, and Nicolas Viccaro on drums. 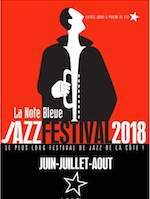 For more information and to reserve a table, phone +377 93 50 05 02, email programmation[at]lanotebleue.mc, and for full program visit the venue website at: La Note Bleue: festival.